Bats are perhaps one of the most misunderstood of all mammals because of their nocturnal and secretive lifestyle. They often are the subject of myths that impair their reputation. To help dispel their bad reputation, we often engage the public in field trips to sample and inventory their local bat fauna. This provides a unique opportunity for local kids and adults to learn the benefits and importance of bats in their own backyard. Three bat houses on UF campus. The World’s Largest Occupied Bat Houses are hosted on the UF’s main campus. 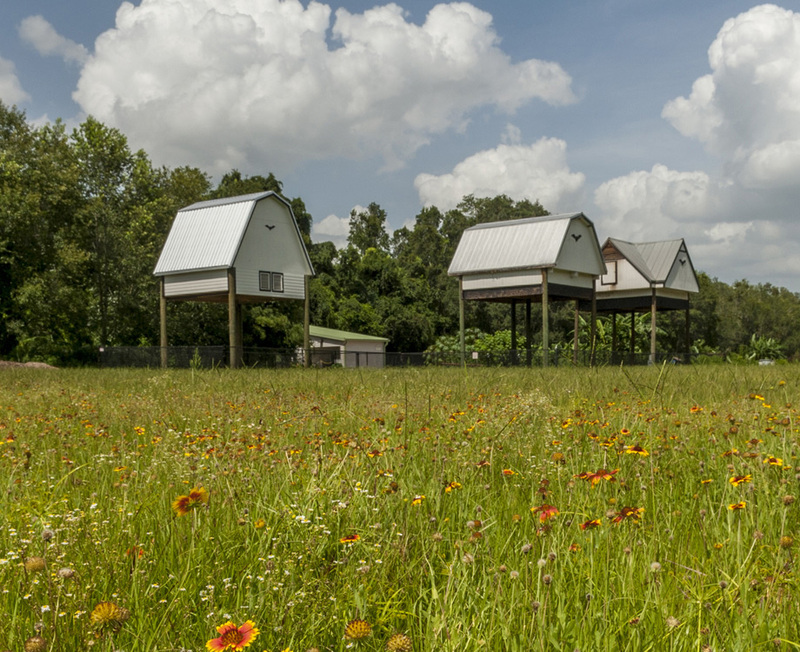 Two bat ‘barns’ and a bat ‘house’ are located on the north side of Museum Road across from Lake Alice on the UF campus. Museum specimens are frequently used to give presentations on a range of subjects including biodiversity, conservation, and form and function. These presentations have been given at public libraries, schools, the Lubee Foundation, and Powell Hall by graduate students in the Reed Lab and by Candace McCaffery, collection manager of the Mammal Collection. 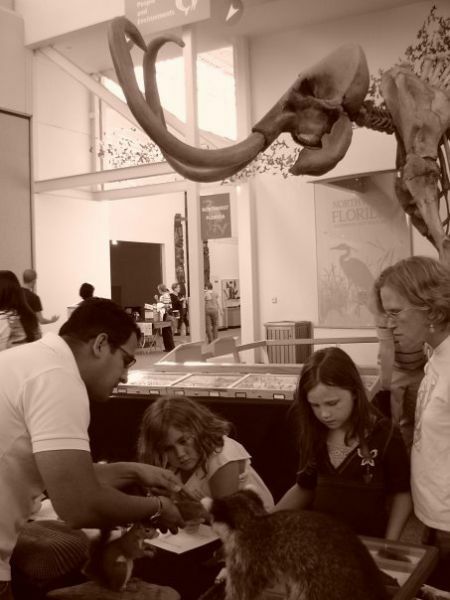 The Mammal Collection also provides specimens to be used in educational displays in the lobby of Dickinson Hall. By using museum specimens to give public presentations, we can raise awareness and appreciation of global biodiversity and promote a shared concern for conservation between the general public and researchers. Dr. Bruce MacFadden and Dr. David Reed organized a seminar series entitled “Public engagement in science” where our guest speakers were not only top-notch scientists, but they also involved the public directly in some aspect of their research. Half of the speakers were external to The University of Florida. 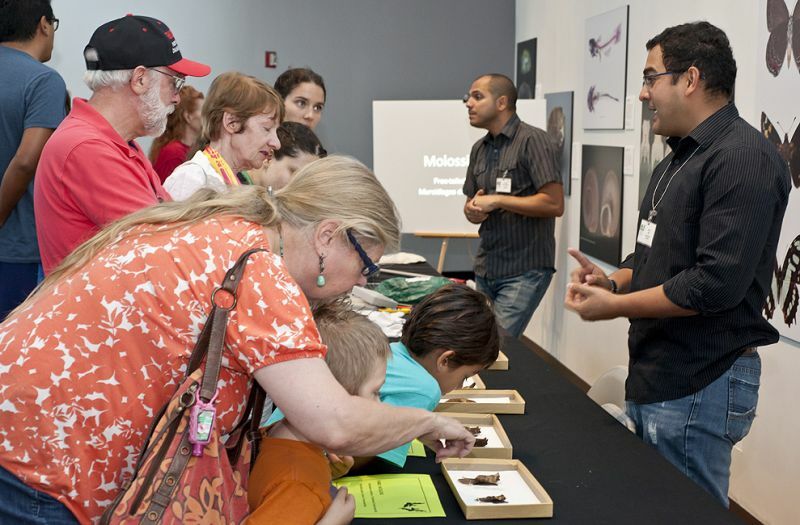 The seminar series was held immediately following the Museum-wide staff meetings to encourage scientists and non-scientists to attend. In addition, the talks were publicized and the general public was invited. The speakers were asked to prepare their talks for a very broad audience.